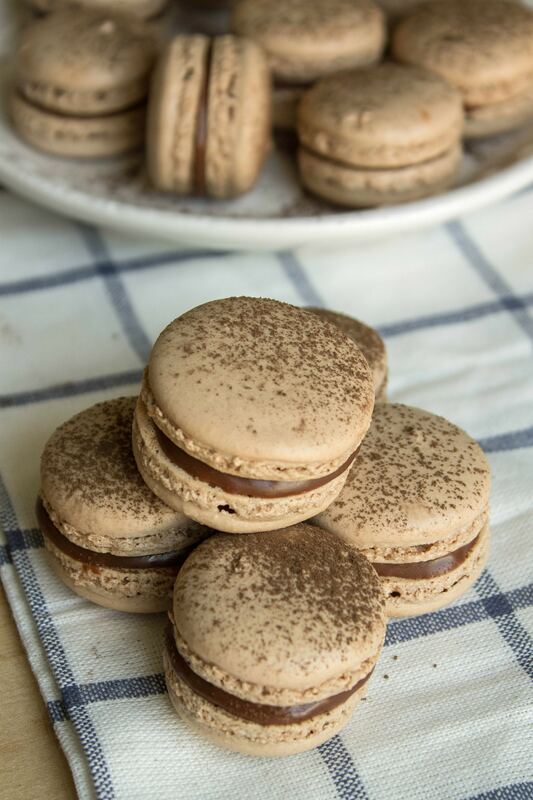 Nutella Macarons – A classic chewy french cookie made with chocolate hazelnut spread (Nutella). A few weeks ago, you might remember that I tried making French macarons for the first time. Well, it didn’t go exactly as planned. They tasted amazing, but they just didn’t look like traditional french macarons. I spent so much time researching proper macaron technique so I was sure that I could get these right. Regardless of my planning, the tops of the macarons were cracked and bumpy and looked more like brownies. It was a humbling experience for sure. It’s been a while since I’ve messed up a recipe this bad. But I was determined to get these right! When I saw that my local Sur La Table was offering macaron classes, I jumped at the chance to learn proper technique in person. The trickiest part of the macaron process is mixing the dry and wet ingredients together. If you under mix the ingredients, the macarons are too dry and will crack because they have too much air. If you over mix them, you get really dense, chewy macarons (this is what I did the first time). I thought that if I saw what the batter was supposed to look like in person, I would finally get them right on my own. A macaron template with smaller macarons. The template I used last time had macarons that were a little too big so I only got like 15 macarons from the batter. The chef recommended this template instead. Really good baking sheets. I’ve had the same old baking sheets for as long as I can remember. They are super thin and wayyy too dark. So a baking sheet upgrade was definitely something I’ve been thinking about lately. The chef said that the thin baking sheets could be causing the shells to get too hot and crack. That’s all I needed to hear to push me to get new baking sheets. I decided on these because they are super heavy material and hold an even temperature. Oven thermometer. The chef said my macarons could have cracked because of the oven temperature. If it’s too hot, that will cause the macarons to release too much steam and crack. The only way to know what the true temperature is for my oven is to buy an over thermometer. So I did. This is the one I bought since I can just hang it from the top rack. Turns out, my oven is the correct temperature, but it’s good to have that cleared up now. A smaller piping tip. I realized that the macarons I made before were so big because the piping tip I bought was too big. So I bought one half the size based on the recommendation from the chef. With all these new tools in hand and the knowledge I gained from the class, I felt much more confident to tackle these macarons a second time. But what flavor was I going to make? I asked my readers and you guys picked…. Nutella macarons! Guys!!! They look 1000000x better this time. I swear I almost cried when I took them out of the over. No cracks! And they tasted pretty great too! I could tell that they were a little drier than they were supposed to be, which means that I didn’t mix them enough. Now I know what to focus on for the next attempt. It is super important to age your egg whites before you make the meringue. This means that you let the egg whites sit at room temperature for 24-48 hours. This will help the meringue get to the consistency you need. When pipping the batter into circles, hold the tip in the center of the circle and pipe straight down, not in a circle. I piped in a circle before and it made the macarons too big and uneven. If you pipe from the middle, the batter will naturally spread to the exterior and form a circle. Let the piping tip work for you. After you finish piping all the circles, slam the baking sheet on the counter a couple times to release air bubbles. You’ll see air bubbles come to the surface. Use a toothpick to pop these air bubbles. Don’t spend too much time doing this, though (only about 5 minutes). The batter will start drying so if you poke too many holes when the batter is dry, they will stay there and you’ll have holes all over your shells. Before you start piping the filling onto the macaron shells, make sure you match up the shells so they have an equal counter part. As much as you try, you probably won’t have all shells the exact same size. So before you start piping, you need to match each shell with an equally-sized shell. Otherwise, you’ll be scrambling to find a matching shell after you’ve already piped and that’s no fun. Okay, I think you’ve got everything you need to make these macarons go perfectly! Go ahead and give them a try. I have faith that you can do this. If you run into any issues, leave a comment below and I’ll try my best to help you out. Good luck!! A classic French cookie, with a chocolate-hazelnut twist. 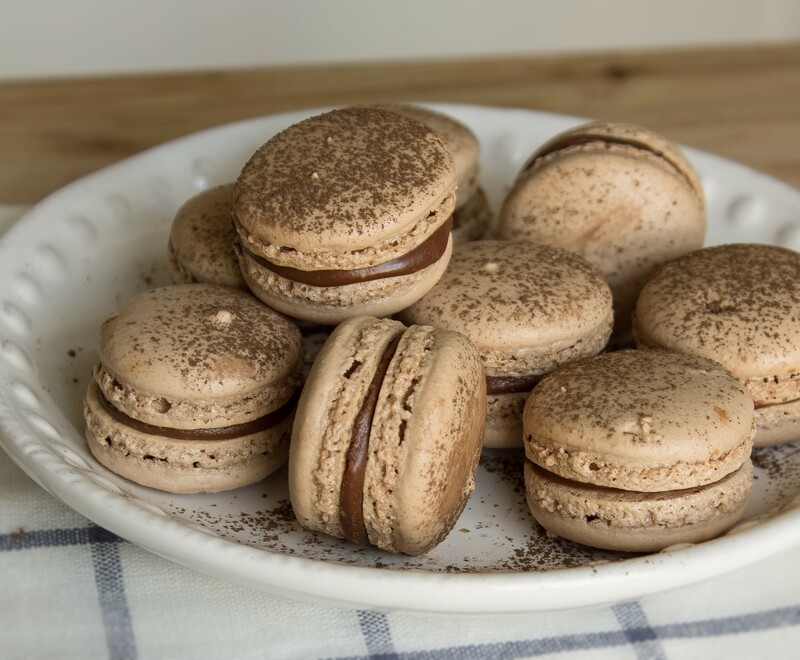 These Nutella Macarons will not disappoint! Prepare two baking sheets by placing two macaron templates on each sheet. You can print the templates above. Place parchment paper over the templates. Set baking sheets aside. Add powdered sugar, cocoa powder, and almond flour to the bowl of a food processor. Process the ingredients for about 30 seconds so that the mixture is super fine. Sieve the flour and sugar mixture three times. Set mixture aside. In the bowl of a stand mixer with a whisk attachment, add egg whites and cream of tartar and begin to beat on medium-high until it begins to foam. Once it starts to get foamy, begin to slowly sprinkle the granulated sugar into the egg whites until it's all been incorporated. 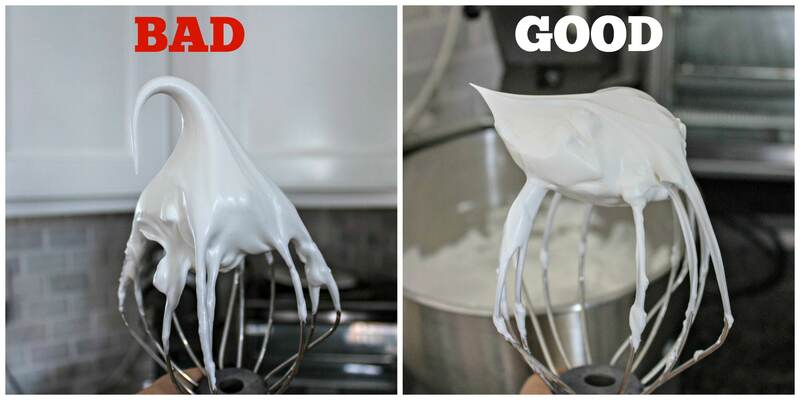 Increase the speed to high to whip the meringue into stiff peaks. The meringue should have the consistency of shaving cream, NOT soft serve. Bake macarons in preheated oven, one sheet at a time for 14-16 minutes. Make sure to rotate the sheet halfway through, for even baking. Remove from oven and let them cool for 5 minutes before transferring parchment sheet to a wire rack to finish cooling. 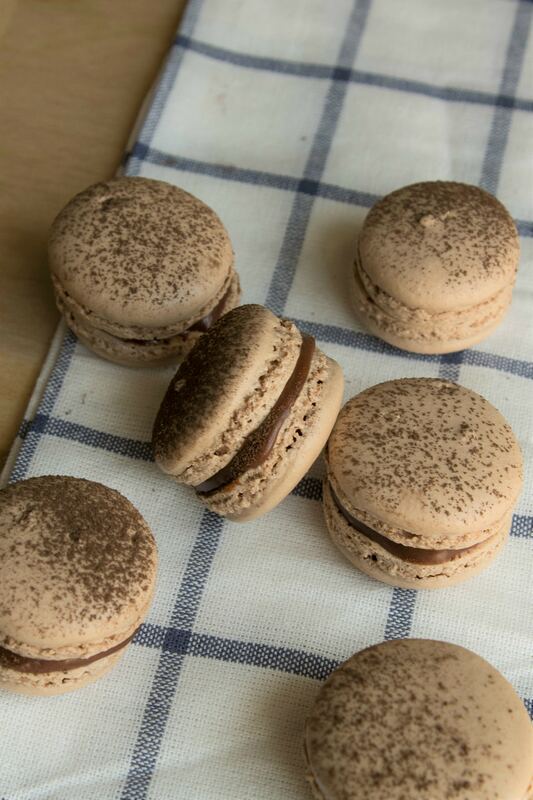 While macarons cool, add Nutella to a piping bag without a tip. Lay half of the macarons flat side up on a baking sheet. Pipe a small cherry-sized amount of Nutella in the center of one shell. Top with the other shell and gently press just enough to push the filling out to the edges. Do this for all the macaron shells until done. Once filled, macarons can be refrigerated in an airtight container for up to three days. I made these today, and they came out much darker than yours. Wonder why?? Also, how do you know when they are done baking? First batch I took out after 14 minutes and they fell flat. Last batch I left in longer and they were too crunchy and brittle. These are tricky little cookies! These came out great! I used my own macaron recipe, but I added a little more than a tbsp of cocoa powder to the batter, which made them a little more chocolatey, and they were absolutely decadent. This is a new staple in my macaron recipe library! Yay! So glad you like them! Thanks for sharing! These look amazing! Unfortunately they did not work out for me and I am not sure why. I slightly under mixed them and I was aware of that as soon as I had them on baking trays. They would not dry even though the air in my apartment is very dry with the heater on, and they were soft and sticky after 25 minutes of baking. I’m not sure why this happened, I have made macarons multiple times before. Oh no! I’m sorry to hear this. Did you have super stiff egg whites? Did you weigh your ingredients? Next time, feel free to use your own macaron recipe, if you trust it more. Just add the cocoa to give the shells the right color. I read somewhere this tip which helped A LOT! 3. Place baking trays on the opened oven door. even if its pouring outside/ humid, the skin will form; for me it worked in 10 minutes. Hi Sharon, what do you sprinkle on the top of the shells – cocoa powder? Hi Megan! Yup, I sprinkled cocoa powder. Sorry for the delay in getting back to you!! 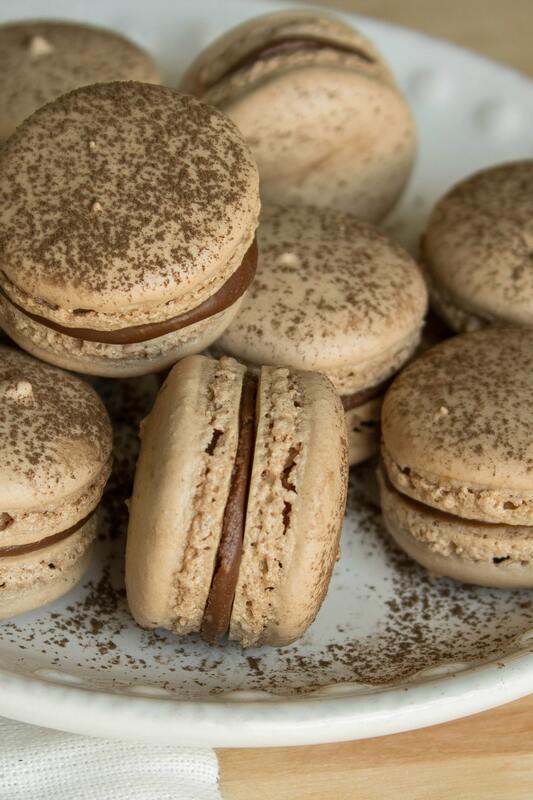 Can you use this recipe without the cocoa powder just as a plain macaron? Or would you have to replace that with more almond flour? Good question! You can simply remove the cocoa powder if you don’t want it. No need to replace it with more flour. Hi! These look great! Was wondering if the recipe produces 40 complete sandwiched cookies after filling or 40 single cookies, before filling them up? Hi Rachael! Thanks for the question. The recipe yields 40 completed sandwich cookies after filling. Let me know if you have any other questions! Just made these and they turned out amazing! Thanks for all the tips and pointers at the beginning – it was hugely helpful! Yay! I am so glad it was so helpful to you and that they turned out so great!! Once you make macarons once, you’re gonna want to make so many other flavors. Hope you try some others out! Your macarons look AMAZING! I have tried (and tried and tried) to get them right but mine are always mediocre. Thanks for sharing your tips! I’ll have to give it another try. Thanks Allison! It means a lot to hear that. These were definitely a challenge, but after taking a class, I felt so much more confident! If you can’t take a class, there are great videos on YouTube and Skillshare. Good luck with them!! Thanks so much! Glad I could inspire you 🙂 If you have any other questions, just let me know! Gah these are beautiful! Somehow I still haven’t gotten around to making macarons…partly because I’ve heard the rumors about how challenging they can be…but your post makes me feel like it’s time to take the plunge! And Nutella? Obviously I’m in! Thank you so much! Yes, you can do this! I was super against it at first. But once you start researching it and watching videos, it doesn’t seem so bad. Plus, you don’t need that many ingredients. Let me know if you have any questions on the process! I really enjoy you explaining how you messed and what you did to fix it. I am going to let my daughter read this. As she is learning to cook. She wants to give up when she messes up. I hope her reading this will help her to try and try again till you get it right. I’m so happy to hear that! I used to be the same way when I was first starting to bake. She should check out my posts about doughnuts. I made them twice for the blog because the first attempt did not go as planned haha. Good luck to your daughter and I hope she sticks with it! These look absolutely delicious. Unfortunately I think the recipe is completely over my head! Simply amazing! Aw don’t say that! I thought the exact same thing. But if you really want to do it, there are so many resources out there to make you for comfortable with the challenge. Thanks for the feedback! Wow these are beautiful. So proud that you didn’t give up and tried again. Great job! Thank so much! It’s important to keep challenging yourself to grow as a baker!